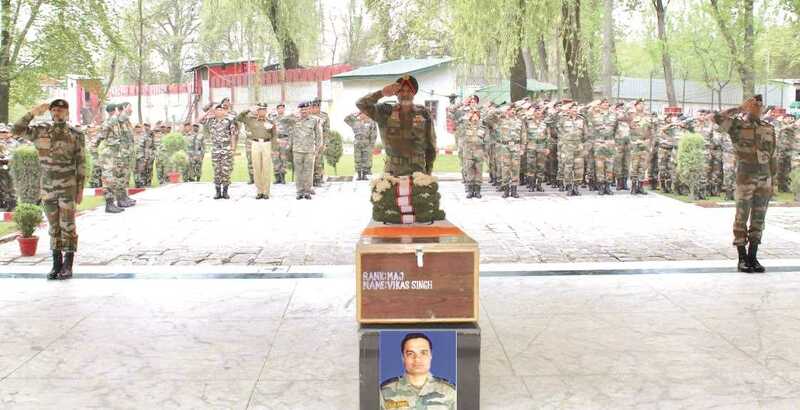 The Army on Monday paid tribute to Maj Vikas Singh who died after slipping into a gorge in north Kashmir’s Kupwara district on Sunday. Officials said due to the length of the fall, the officer sustained grievous injuries to his head and chest. He was evacuated to 92 Base Hospital for medical treatment, but succumbed to the injuries sustained during the fall, said the spokesman. Lt Gen KJS Dhillon, Chinar Corps Commander and all ranks paid homage to the slain officer. In a show of solidarity, representatives from other security agencies also paid their last respects to the officer. The spokesman said Maj Vikas Singh, 29, had joined the Army in 2010. He belonged to Tarighat village of Ghazipur district of Uttar Pradesh and is survived by his wife and a daughter. “His mortal remains were flown for last rites to his native place, where he would be laid to rest with full military honours. In this hour of grief, the Army stands in solidarity with the bereaved family and remains committed to their dignity and wellbeing, said the spokesman.